Who says living has to take place in a house? Who says working has to take place in an office?! 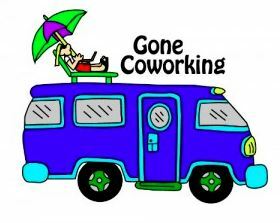 Gone Coworking was dreamed up by Joe and Brie; two crazy kids who embarked on a summer-long RV trip to see the country while there’s still something left to see. In the summer of 2011, we set out to explore the USA in a 28′ RV. For 6 months, we traveled the country to see what it’s like to be a truly location-independent freelancer. Along the way we visited coworking spaces big and small to swap stories and marvel at the emerging coworking movement! Although we’re no longer living on the road, we haven’t stopped learning, thinking, and writing about coworking. Joe now writes about coworking and collaborative consumption for various blogs and sites, and is the co-author of an ongoing series of ebooks about coworking and the mobile workforce. You can follow our adventures, interviews, blunders and epiphanies on this site as well as Facebook, and Twitter. Along the way, we hope to prove that through the phenomena of coworking, traveling doesn’t have to mean isolation. Coworkers can plug in to ready-made communities of like-minded, independent workers wherever we go!